March soybeans turned down overnight after testing resistance at the 200-day moving average. Fund selling continued on through the day. The USDA made a rare soymeal export sales announcement of old/new crop meal sold to Ecuador. The business was seen as routine and had no impact on Monday’s trade. Funds were estimated sellers of 9,000 soybean contracts to start of the week. 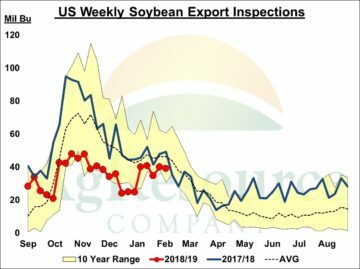 US soybean export inspections for last week were near unchanged from the previous week and totaled 39 Mil Bu. There were 18 Mil Bu loaded for China with more than half of loaded out of the Gulf. Cumulative inspections, are slowly catching up to last year. However, the cumulative total of 831 Mil Bu is still 37% or nearly 500 Mil Bu behind last year. Next support for March soybeans is near $9.00, where both the 100-day moving average and a longer-term uptrend line cross. Major USDA reports have passed and the market remains focused on negotiations with China.